Microsoft PowerPoint is a popular presentation program that used by business people, educators, students and trainers. 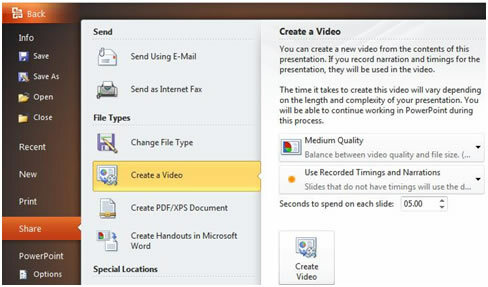 As we know, the upcoming release of Microsoft PowerPoint 2010 has a new built-in function of Create a Video without using an external video converter program. Wondershare PPT to Video is very prevalent used by people to convert the PowerPoint presentation to almost all popular video formats with excellent quality. Today I’d like to give a comparison between the new function of convert PowerPoin 2010 to video and the typical professional PowerPoint to Video Converter. Below create a video Share choose the output quality and set the transition time between the slides. It will take you more than 13 minutes wait for the output video file come out which the presentation with only 12 slides and no video or audio files added. You can view the presses very clearly on the converting window and only spend 3 minutes or so for you to convert the same presentation. WMV is the only one default output video format support by Microsoft PowerPoint 2010. Wondershare PPT2Video Pro would help you save your presentation with almost popular video formats, such as WMV, AVI, MPEG, MOV, MP4,3GP and FLV and so on. PowerPoint 2010 does not support this function. You can only create a PowerPoint to video at one time. PowerPoint to Video converter is support this function and you can convert 12 PowerPoint files to video at a time. PowerPoint 2010 supports embedding video from online video sites, like YouTube. Once you want to view the output video file with YouTube video embedded, you must make sure your computer with the internet connected. In addition, you can only choose the quality of the video. After you have added some video or audio files to your presentation, There is no sound or any other effect gets lost with PowerPoint to Video Converter and you no need to worry about whether your computer have the internet connect or not. Furthermore, you can set the frame rate, quality, and encoder of the video. According to above figures, we can conclude that the new function of Microsoft PowerPoint 2010 to create a video may not live up to your certain expectations. However, Wondershare PPT2Video Pro is an easy-to-use, efficient PowerPoint to video converter. Once you want to save PowerPoint to video, you can use PowerPoint to Video Converter. If your slide show is too large with hundreds of MB, you may also consider saving it on DVD for distributing and sharing. 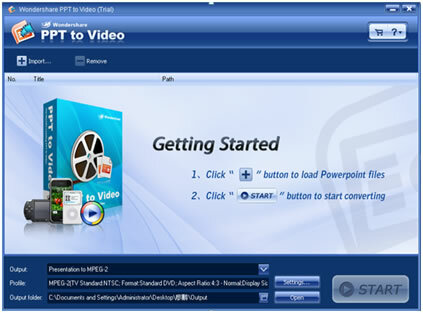 Wondershare PPT2DVD would help you convert PowerPoint to DVD with music and all animations retained.